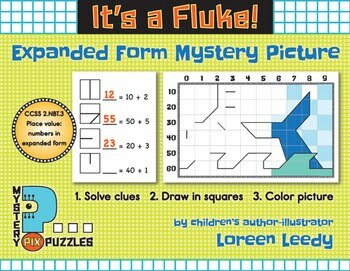 Your kiddos will have a whale of a time reinforcing place value while solving this mystery picture puzzle. First they will fill in the Numeral = Expanded Form blanks on the clues printout. Next they’ll draw the lines shown by the clue into the corresponding square in their grid/graph. To locate a particular square in the grid, they’ll use the Tens along the left side of the grid and the Ones along the top. If the clues have been solved correctly, a scene of sun, waves, and a whale tail will appear. When the puzzle is complete, students are free to color it in with their choice of colors so each picture will be unique. Aligned with Common Core Math standard CCSS.2.NBT.A.3 Understand place value: Read and write numbers to 1000 using base-ten numerals, number names, and expanded form. This “starter” puzzle goes up to the number 69 and has thirty-six clues. 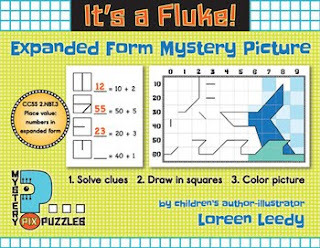 For more Expanded Form Place Value mystery pictures, click here. For Rounding to nearest 10 or 100 mystery pictures, click this link. See my Fall Fun Color-by-Place-Value pictures at this link. Click to see all my Math resources.